SHERIDAN SENIOR HIGH SCHOOL, built in 1970, is one of the most modern in Arkansas. Built at a cost of $900,000, it contains 65,000 sq. ft. of floor space and has 28 classrooms in addition to a gymnasium, offices, and one of the best equipped Agricultural shops in the state. Construction is of concrete blocks, bricks and steel. The sign in front of the building is the original one placed in front of the old 1913 high school by the Class of 27-28. Sheridan Schools, one of the fastest growing school systems in Arkansas, had its beginning in a two-story frame building which stood at the present site of the old brick Agriculture building near the Kelly-Williams gymnasium at the old high school. It is known that I. W. Blacklock was a teacher in the school during the last year it was used. In 1913, the Sheridan School District erected the first brick building ever used in Grant County near the site of the first school. The building had two floors, each floor divided into four rooms. The first graduating class of the then new high school contained one senior – the late Sam L. McDonald. I. W. Blacklock was principal of the school. During the years from 1913 through 1924, heading the school as either principal or superintendent were I. W. Blacklock, 1914-15; J. M. Cathy, 1916; H. A. Bruce, 1917; John R. Hubbard, 1918; Ed F. McDonald, 1919-1920; Thomas H. Berry, 1921-23, and S. A. Sims, 1924. Between the years of 1925 and 1933, L. A. Francis, E. D. Brandon, and Alton Thomas headed the school as superintendents. In 1933, at the height of America’s worst economic depression, A. R. McKenzie took over the office as Superintendent, offering to assume full duties with no pay above his regular salary as Agriculture teacher, a position he had assumed when he first came to Sheridan in 1924. To alleviate the condition of low finances, Student Government was adopted. The part the students played in keeping an honor study hall saved the school one teacher’s salary. In 1936, Sheridan school district purchased the Missionary Baptist College property for $7,500, and set it up as Sheridan Elementary School. After the college building burned in November, 1957, the present grade school was constructed. McKenzie Hall, still used by the school system, was built as an N.Y.A. project in 1942. A bond issue passed in 1947 was used to finance the construction of a new gymnasium – named the Kelly-Gymnasium, and a new music building, Mitchell Hall, named for Coats A. Mitchell, a long-time school board member, was also finished that year. The new grade school was occupied in 1957. 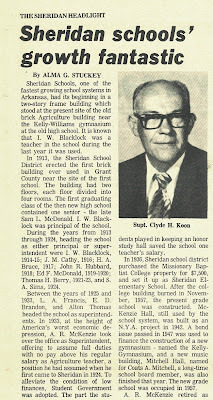 A. R. McKenzie retired as Superintendent in 1962, and Clyde H. Koon took over as head of the Sheridan School System. The first year he served as superintendent, the enrollment in Sheridan Schools was 1300. There was a total of 55 teachers on the faculty. In 1963, the Sheridan District approved a $400,000 bond issue, and Arkansas’s first ultra modern air-conditioned, windowless school was built for grades 9 through 12. The Student Council landscaped the grounds and built a fountain in front of the building. The fountain was dedicated to Mrs. R. H. Thornton, longtime student council sponsor. The Sheridan School Board purchased 20 acres of land on the west side of town in 1967 for the purpose of locating a new high school there. In 1969, voters in District 37 approved a 10-mill tax increase and a bond issue of $1,233,000. Enough of the bonds were sold to construct a new senior high school and a cafeteria to be shared with the grade school. In 1972, the remaining bonds were sold and a new gymnasium and agri shop were built. Four new air-conditioned rooms were built at East End School, a part of the Sheridan system. 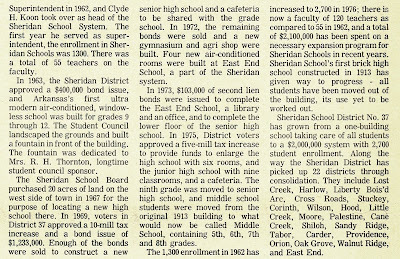 In 1973, $103,000 of second lien bonds were issued to complete the East End School, a library and an office, and to complete the lower floor of the senior high school. In 1975, District voters approved a five-mill tax increase to provide funds to enlarge the high school with six rooms, and the junior high school with nine classrooms, and a cafeteria. The ninth grade was moved to senior high school, and middle school students were moved from the original 1913 building to what would now be called Middle School, containing 5th, 6th, 7th, and 8th grades. 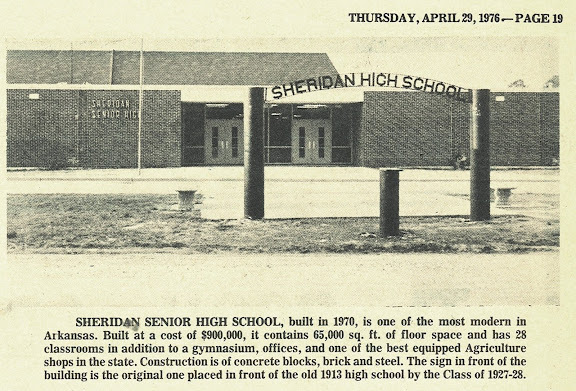 The 1,300 enrollment in 1962 has increased to 2,700 in 1976; there is now a faculty of 120 teachers as compared to 55 in 1962, and a total of $2,100,000 has been spent on a necessary expansion program for Sheridan Schools in recent years. Sheridan School’s first brick high school constructed in 1913 has given way to progress – all students have been moved out of the building, its use yet to be worked out. Sheridan School District No. 37 has grown from a one-building school taking care of all students to a $2,000,000 system with 2,700 student enrollment. Along the way the Sheridan District has picked up 22 districts through consolidation. They include Lost Creek, Harlow, Liberty Bois’d Arc, Cross Roads, Stuckey, Corinth, Wilson, Hood, Little Creek, Moore, Palestine, Cane Creek, Shiloh, Sandy Ridge, Tabor, Carder, Providence, Orion, Oak Grove, Walnut Ridge, and East End. Again, many thanks to Vicki Ausbrooks for typing out all of the lengthy newspaper articles you're reading on this blog. Yes, the old sign is at the Grant County Museum. I saw it yesterday. Mr. Wallace, the director, said they plan on fixing it up and putting it on display with the little red school house they moved to the museum years ago. The school sign is in bad shape. Thanks for taking the time to discuss this, I feel strongly about it and love learning more on this topic. mayo international school patparganjIf possible, as you gain expertise, would you mind updating your blog with extra information? It is extremely helpful for me. I can see that you are an expert at your field! I am launching a website soon, and your information will be very useful for me.. sankardev college shillong Thanks for all your help and wishing you all the success in your business.